1. New TV! Fall is when the new TV season starts on the major networks. Thank goodness for tivo, I can catch up on everything I miss when I have classes. 2. 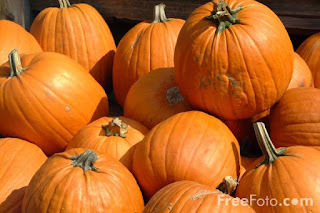 Pumpkins - to decorate, to carve, to scent the room, and to eat. Pumpkin pies, pumpkin cookies, pumpkin ice cream, you can pretty much find it everywhere in the fall. And the pumpkin puree itself is low in calories, so it's a good substitute for oil in cake and brownie mixes. 3. Leaves. The colors are gorgeous. Once the leaves turn here in NC (they aren't even close), I plan on trying to capture some of the scarlets, ambers, golds, and crimsons in print. 4. Sweaters. Fall is sweater (and sweatshirt) weather. I don't have quite the array of sweaters in NC as I did when I lived up north, but I will hold on to my hooded Ohio State sweatshirt until it falls apart at the seams. The cuffs are starting to fray, but I don't care. 5. Fireplaces. I don't have one in my apartment, but I love the sound of a crackling fireplace and the smell of the fireplace smoke in the air outside. That is what fall smells like for me. 6. Football. Specifically college football. Go Bucks!!! Fall is football season and it is my favorite of all the sports. I miss games at the Shoe in Columbus and I have yet to see the Patriots at Gillette. Hopefully one of these days I will get to one of them - or both. 7. Movies. Fall is premiere movie season. Different than summer blockbuster season, fall is when the studios release the movies they feel are worthy of an award nomination, so all the greats come out to play. 8. Weather. Fall has my favorite days, late fall here in NC. The days when it's just cold enough you need a jacket, there's that bite in the air. Well, I don't wear a jacket those days. It generally has to be in the 40s for me to don a coat, I live for the crisp autumn air. 9. Baking. I mentioned the pumpkins back in #2. Fall is prime baking weather. Sometimes in the summer it's just too warm, even when you have central air and you don't want something so heavy as a cake or pie. Fall is when I get back to baking. Although since I am moving in the next couple of months to a new apartment and I've started to pack things up, my baking may be curtailed this season. 10. World Series - but only the years the Red Sox make the playoffs. Any other year, I don't care. I'm too wrapped up in numbers 1 and 6 to care about another team. I lived in MA for 8 yrs and miss the leaves changing colors!